In an official home game for Dunedin played at Spectrum Field, the Blue Jays received a conclusive pitching performance from the combination of RHPs Nate Pearson, Graham Spraker, and Turner Larkins surrendered just two earned runs while striking out 11 hitters combined. RHP Nate Pearson made his first opening day start of his career and his first in 11 months after missing most of 2018 with a season ending injury. Pearson threw five strong innings, striking out six and exited retiring eight consecutive hitters. Righty Graham Spraker came on in relief and threw three impressive scoreless frames, while RHP Turner Larkings-despite giving up a run in the ninth-finished the win off with 19 pitches thrown. Clearwater opened the scoring in the top of the third on Edgar Cabral's solo home run over the wall in left off Pearson. In the bottom of the fourth the D-Jays bats came alive against RHP Spencer Howard. Cal Stevenson kick started the rally with a solo home run to right to tie the game at one. After Chavez Young and Christian Williams singled and doubled respectively, Logan Warmoth drove in a run on an RBI groundout. Ryan Noda then stepped in and smacked a single to left scoring Williams to cap off the three run fourth. Dunedin's bats exploded off RHP Gustavo Armas in the bottom of the sixth with six runs plated and 11 men coming to the plate. Four consecutive hits from Vladimir Guerrero Jr., Williams, Warmoth, Noda plated two Blue Jays' runs to extend the Dunedin lead. Two batters later, Kevin Vicuna smashed a single to right scoring Noda. Cal Stevenson drove in a couple more runs with an RBI single and error combination knocking Armas out of the game and finishing off the six run fury. Dunedin tacked on two more runs in the bottom of the seventh when Riley Adams yanked a line drive homer over the wall in left. The Blue Jays out-hit Clearwater 14-8 and have now won seven of the last eight games on opening night. 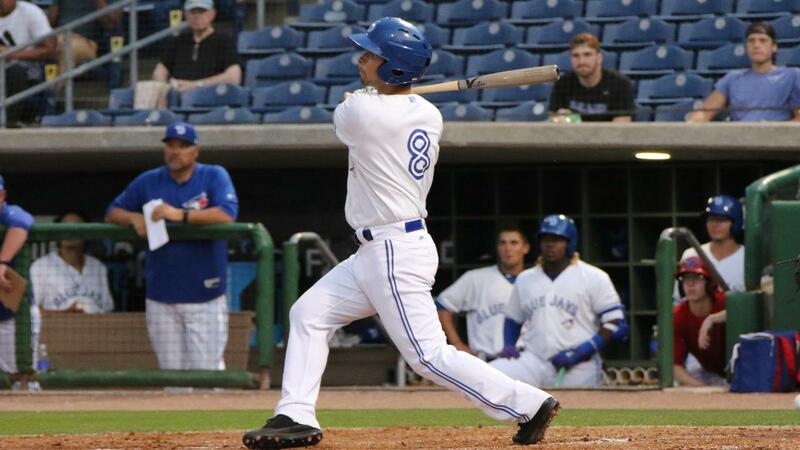 Cal Stevenson continued his momentum from a phenomenal professional rookie season with a three RBI night while Warmoth, Adams and Noda each drove in two. Every hitter in the Blue Jays starting lineup registered at least one hit. The series continues tomorrow at 6:30 P.M. at Spectrum Field for game two of the four game set. RHP Maximo Castillo makes the start for Dunedin against LHP Damon Jones for Clearwater. All the live action can be heard on the Dunedin Blue Jays Baseball Network through TuneIn radio.com and the TuneIn radio app with coverage beginning at 6:15 P.M.